The former French Prime Minister, Dominique de Villepin goes on trial on charges of plotting to discredit the then Interior Minister, now President, Nicolas Sarkozy. The hearing is expected to last at least four weeks. This explosive and incredibly complex trial has all the elements of a blockbuster political thriller, a former Prime Minister from the political elite, accused of conducting a smear campaign against a rival outsider to try to spoil his chances of becoming President. 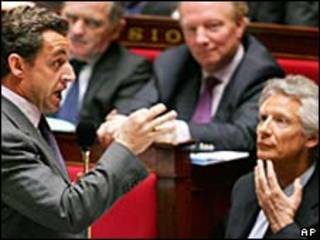 The case dates back five years, when Nicolas Sarkozy's name appeared on a list sent to the former French Prime Minister of top politicians and businessmen who were wrongly linked to an illegal bank account in Luxembourg. It was alleged those named on the list had received bribes from international arms sales. When a judge concluded the listings were false, the focus of the investigation quickly became who was behind the spurious allegations. Magistrates want to know whether that person was Dominique De Villepin. If he's found guilty, the former Prime Minister faces up to five years in prison and a heavy fine. He denies any wrongdoing.